These blemished seats have a quality rating of 3. 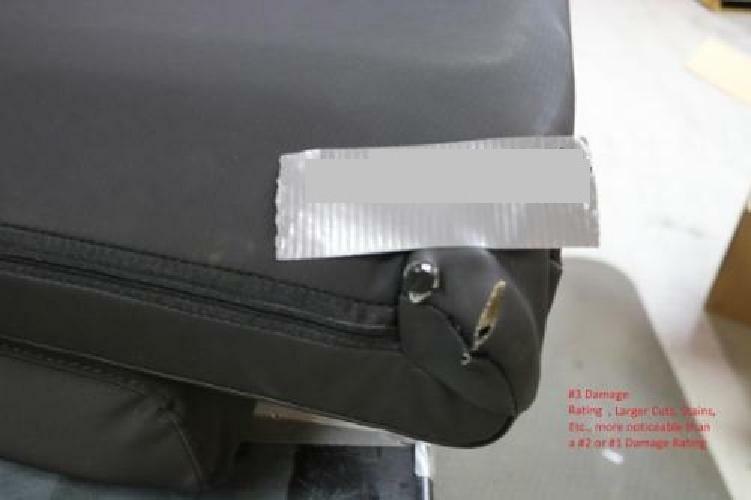 A rating of 3 means these seats have more noticeable damage, and typically larger areas of damage, as compared to a Rating 1 or Rating 2. ." Large cuts, Large Stains, etc. are usually what are found. Look at secondary photo for an example of what you would receive. These seats are great for somebody that is going to recover them, or simply want a functioning NEW seat, but aesthetics are not overly important. 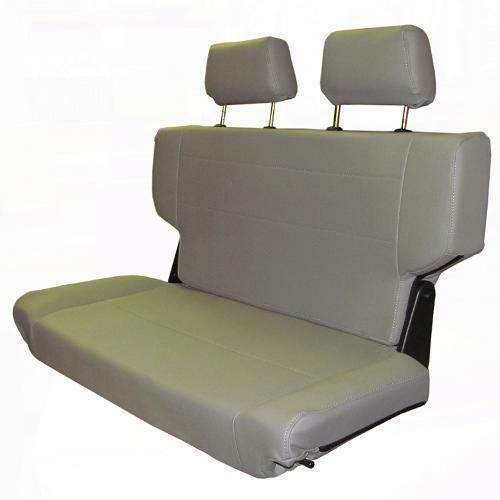 Gray Fold & Tumble Rear Bench Seat with Mounting Hardware and NOW HEADRESTS for 66-77 Classic Ford Broncos. Quick release mechanism. Added room without the pain of unbolting. Simply release the latch, fold and tumble and you have the room for your gear, cooler, or anything you need to carry. Seats are made of high quality denim. Black and Spice also available. This is the absolute best fitting Fold & Tumble seat available for the Early Broncos. The seat fills the entire width from wheel well to wheel well allowing you to utilize the full amount of seating space available. Other seats leave 6" or more of unused seating space. This seat is a full 40" wide, same as the wheel to wheel opening. Includes custom mounting brackets. Rear retainer bracket bolts into the factory rear seat belt holes (seat bolts mount in same hole above the bracket). Front hinge brackets require drilling of 2 holes per side.